Welcome to the ePublic Health Talks blog! Thanks for joining us for our first post. We hope you will learn something new and share it with your colleagues. Your feedback is greatly appreciated and helps us improve the content of our blog. Please leave us a comment. 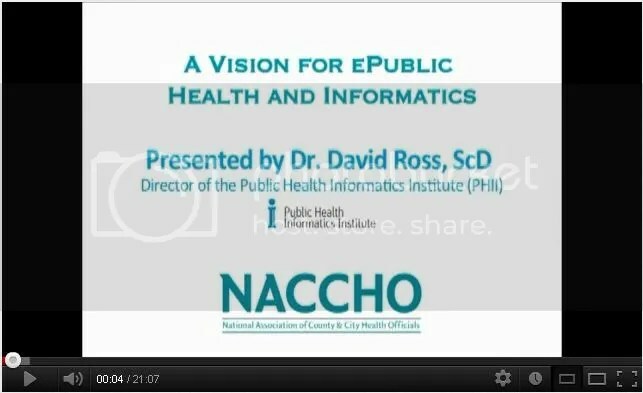 In this video, Dr. David Ross of the Public Health Informatics Institute gives a historic review of public health informatics and the vision he created 17 years ago. Dr. Ross gives sound advice on planning for the technologies of the future while learning from the past. This entry was posted in PH Informatics 101 and tagged Dave Ross, history, public health informatics on September 6, 2012 by ePublic Health Blog.